Can Daily Cardio Help You Lose Weight? 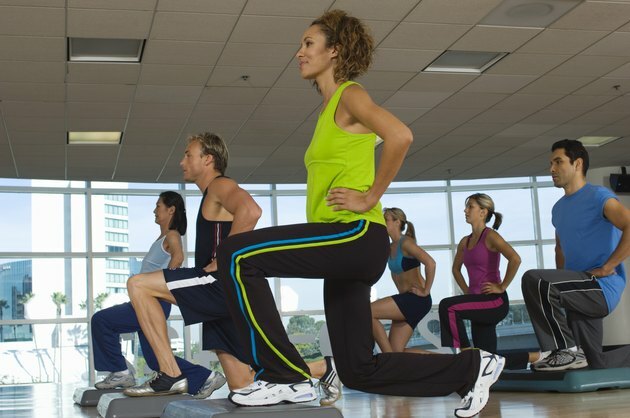 A moderate cardio workout every day helps your body burn extra calories, which can dramatically reduce your weight. The Centers for Disease Control and Prevention recommends 30 minutes of moderate physical activity, five days a week. To lose weight and for greater health benefits, they recommend 60 minutes a day, or 300 minutes a week, of physical activity, including cardio. The body burns calories to access the energy it needs for exercise and daily functioning. It stores excess calories as fat. If you're dieting and reduce your calorie intake too low, your body will shut down unnecessary functions, such as your reproductive system, to reduce its calorie usage. This system helped keep people alive when famine was a common part of the human condition. The human body naturally tries to hold on to stored fat as a survival tactic. If you eat more calories than you burn, your body stores the extra calories as fat at a rate of approximately 3,500 calories per pound of fat. If you burn more calories than you eat, your body burns fat deposits to access that stored energy. Increasing your activity level through exercise is one effective way to increase your calorie burn and lose weight. Working out daily helps you burn off fat in small amounts over time. Cardio, or aerobic, exercise is exercise that increases your heart rate over an extended period of time. Running, swimming and many group fitness classes are examples of cardio workouts, as opposed to strength training, or anaerobic exercise, which builds muscle strength and tone through resistance flexing of target muscles. While cardio may burn more calories during the actual exercise, strength training increases your muscle mass, which burns more calories throughout your daily activities. Celebrity trainer Bill Phillips recommends workout sessions of 20 to 30 minutes. A workout of this length will burn a good deal of calories while not exhausting you too much to work out again the next day. During this workout, aim for an exertion level of 6 to 7 on a scale of 10. Phillips also recommends a 5- to 10-minute cool-down period doing the same exercise at an exertion level of 2 to 3. Gary Taubes, author of "Good Calories, Bad Calories," notes a significant challenge to weight loss through exercise -- exercise increases appetite. When you successfully build a calorie deficit, your body will want to make up for the loss by eating more. While doing daily cardio for weight loss, it's important to keep your calorie intake close to or below what you ate before beginning your workouts. If you're exercising daily on a limited calorie load, you want to make the most of the calories you do consume. Harvard nutritionist Walter Willett recommends a diet high in protein, fruits, vegetables and essential oils. He also recommends reducing your carbohydrates and dairy intake. Dr. Mehmet Oz, co-author of "You: The Owner's Manual," suggests taking a multivitamin to make up for any nutritional shortfalls. Under a daily exercise regimen, your body is under extra strain. The right nutrition will help you sustain your workouts without compromising your health.